Today's post is the first in what I hope will become a recurring theme for WaningWoman.com, Spotlight on You. Shawn Kelley is our inaugural Spoy. I've met her in person and I can honestly say, she genuinely makes me smile and I'm very happy that she is part of my support team. Her story may be not unlike your own and I hope that you enjoy it as much as I did. In 2001 I joined Weight Watchers again with my mom and her best friend. I tipped the scales at 375. I wore a 30/32 in both tops and pants and well it was harder to find *cute* clothes for me. Around this time Carnie Wilson had done her surgery and so I checked out a surgeon that was doing WLS and went to their seminar to see what could be done. Because I'd been on WW a while, my approval was easy, and on May 13 I had VBG or Vertical Banded Gastroplasty. Keep in mind, this was back in the dark ages of bariatric surgery when Gastric Bypass was very uncommon and the "friend of a friend who died" story was scary. My recovery from the VBG was not easy. Laparascopic surgery was in it's infancy, so I had an open procedure. Even so, I went on to lose around 100 pounds after the surgery. I joined a gym, I ate less, but still ate crap. At the time online support was in its baby steps and I did not want to drive an hour to support group. Life went on. I had heartaches, many of them, and it was like that just took over. I still had some restriction, but not a whole lot. I was eating around my failing tool. About 4 years afterwards, I ended up in the hospital with pancreatitis, but I was also told, my staple line had come undone. That explained my lack of restriction. I thought about a revision, and I actually was told it was best for me to get one, but mentally I was not in that place to admit defeat and start over again. Fast forward to 2009 and by this time I had been divorced again, found out I had PCOD ( polycystic ovarian disease) and I needed to lose weight. I was also diagnosed with CEBV or Chronic Epstein Barr Virus. Even in the midst of all of this, I met a wonderful man, and we started talking about having children. This is what made me seriously give revision a second look. In January of 2010, I made an appointment with Dr. Kuhn, an insurance approved surgeon who did revisions. At my appointment I was scared and worried that he was going to chide me for failing my surgery, for my regain and such. I could not have been more wrong. He listened to me and didn't just see me as a failed statistic. Soon after, and endoscope and an upper GI confirmed what my surgeon already knew; my surgery failed me. In addition to that, it was causing me major problems. 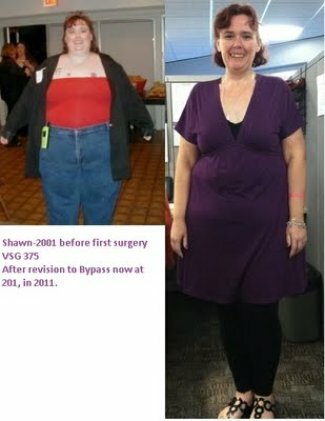 On March 17, I was approved for my revision to Gastric bypass, and on April 15, I went into surgery scared, excited, and nervous that I would fail again. This time, though, I was older with realistic goals in mind like living a healthier life, trying to have a family, and just being happy. Is this easy? NO. I can be lazy and eat things I am not supposed to and I pay for it dearly. Even now at 16 months out I have to work at it. I have found my calorie threshold for eating to maintain as well as lose. I struggle every day. I am not like most who lose 100 pounds in 6 months, hell it took me over a year to lose 100 pounds. As I write this I am 1.6 pounds from 199.9 or Onederland. It is my next goal. Baby steps. But I would not trade this for anything. I can go shopping in *normal* stores and buy clothes. No longer do I have to buy plus sized clothing from a specialty store. Again, this is by no means easy. Every day I have to make sure I am able to eat foods that will benefit me. I try to get in my 60 grams of protein, my vitamins, not eat as many carbs, and get in my fluids. Vitamins for me are the challenge. And with me having issues with some of my vitamins due to above illnesses it is a challenge, but I would not trade it for anything. I have gone in yes 10 years from 375 to 201. At the time of my revision I was 303 doing the Weight Watchers thing again and knowing I needed something better and I had to have help. There are those of us who cannot do this alone, sometimes you need to have the surgery to help you. But in the end, even with surgery, it is still up to you how well you use it. And if you are considering having weight loss surgery, do your research, read everything, do not go by that friends cousin who died story, and most of all find support. I can say without a doubt, that this time around am making sure I have support. I have a wonderful network of support not only near but even far away and for that I would do this all over again. Sometimes, surgeries can fail. If a hammer breaks when you're using it, would you blame yourself? None of us would, but with matters of weight loss surgery, often we aren't so kind to ourselves. Shawn's story is one of acceptance, learning not to beat yourself up when the hammer breaks, and having a support team around you. You can learn more about Shawn's story and her continued progress on her blog, Tatgrl or her FB Fan page. This gives me A LOT of hope, Shawn. I am seriously grateful to have read your story. I have had a lap band for almost a year and have lost/gained/lost 15 (approx) lbs (not counting the 20 I lost pre-surgery). I see my surgeon tonight and am going to bring up revisions, choices, possibilities etc. I want my lapband to work, But it doesn't seem to be doing much for me. I "Only" have 80 lbs to lose.I feel like a failure. Shawn this is wonderful and congratulations to you. you look great. thanks for sharing your story. i haven't had surgery, i'm actually scared out of mind to do so, but i lose some of that fear everytime i hear wonderful stories like yours. it was hard for you, but you overcame it. just wonderful. thank you again. What an inspiring story, Shawn. Thank you for sharing your struggle and journey with us. You are an inspiration to many! SHAWN!!! I love you and WELCOME TO ONEDERLAND baby! I know you just got there! WOOHOO! I love this so much. I love your fight! It let's me know that I'll get there if I don't give up. Thank you for sharing. It was so very inspiring. I needed this today.